Operating under medium vacuum conditions of about 1 Torr pressure, our precursor separation technology enables wide zone isolation gaps, up to 30 millimeters in some cases, which allows uniform deposition on relatively large and irregularly shaped substrates, such as stuffed circuit boards, highly curved optical lenses, and thick planar substrates. The use of our highly efficient plasma process allows low temperature deposition of a wide variety of materials, including Al2O3, SiO2, TiO2, Ta2O5, ZrO2, HfO2, ZnO, and a wide variety of other metal oxides and some metal nitrides at full batch coating speeds up to 10 Å per second, while preserving the unique high quality attributes of ALD coatings. Batch deposition speeds of several angstroms per second – faster than many sputtering processes. Low particulate generation – negligible deposition on interior surfaces other than the annular region of the rotating table that houses the substrates. Low materials costs – precursors are consumed only on the substrate track, while unused exhausted precursor material may be trapped and re-used. Low temperature processing using a simple DC plasma – Al2O3, SiO2, TiO2, and ZnO processes all available at 100°C or lower, even down to room temperature. 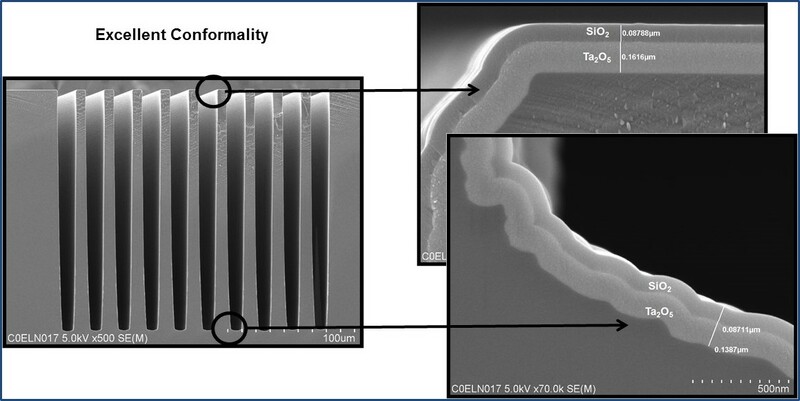 Unique scalability for PEALD – by radially expanding the plasma electrode and precursor zone shaped as wedges of a larger pie, the batch/substrate size may be increased indefinitely without sacrificing batch coating speed.